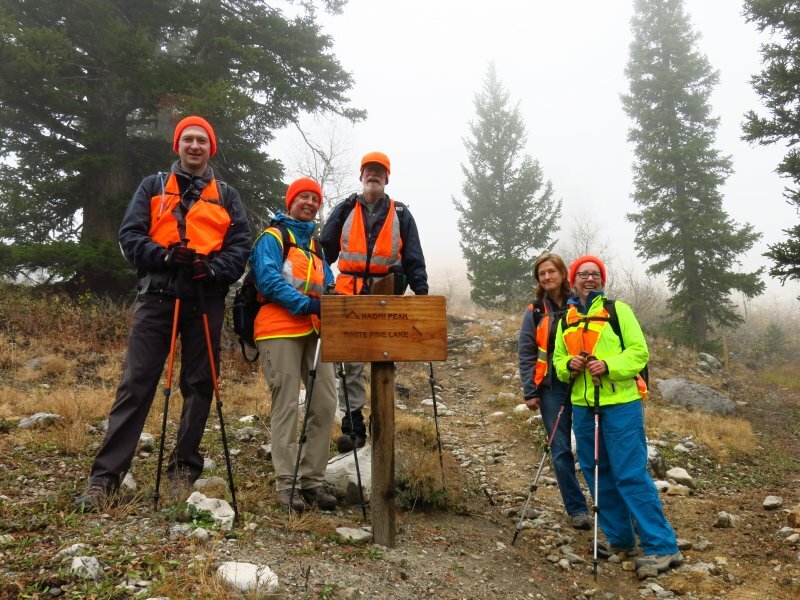 Six Cache Hikers met for this traditional fall hike; Dave P, Kathy, Jane, Nicolai, Deanna and hike leader Dave W. After taking a few minutes to organize carpools, we drove 30 miles up Logan Canyon to Tony Grove. We left a "shuttle" car at the Bunchgrass parking lot on US 89 and loaded everyone into the two other cars for the final 7 miles. At Tony Grove we grudgingly paid the parking fee for each car, donned "blaze orange" attire for additional safety during elk hunting season, and started out under foggy low-hanging clouds. We followed the Mt. Naomi trail past the "world famous" quartzite formation above Tony Grove (as featured in Wikipedia), then turned off on the connecting trail to take us back to the White Pine Trail. While hiking the White Pine we noticed a path heading down Bunchgrass Creek, which prompted us to briefly consider altering - and shortening - our trip via this route. 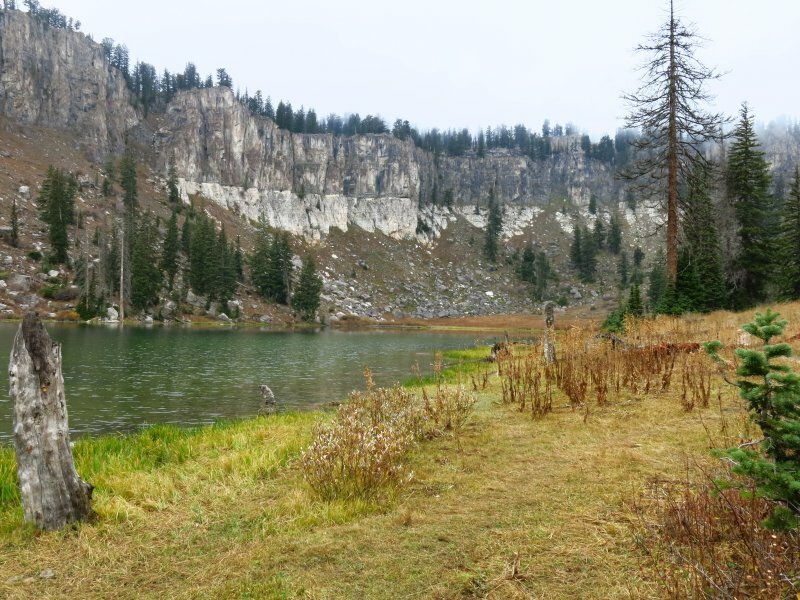 Last year Dave and Jane had an interesting hike here but we decided to continue on to White Pine Lake, as planned. 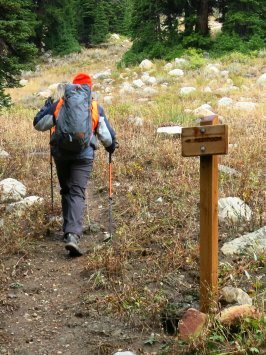 We also passed several groups of backpackers along the way, heading back to Tony Grove after a chilly night of camping at White Pine. Low clouds shrouded Mount Magog and Mount Gog at White Pine Lake, but we were able to enjoy a good view of the lake as we ate lunch. 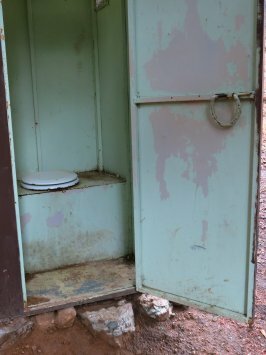 We hiked through the camping area when we started out after lunch, where for the first time in a few years, we found an (apparently) functioning outhouse, a welcome feature given the high numbers of campers using area. The clouds lifted as we descended along White Pine Creek so we finally were able to see Mount Gog. 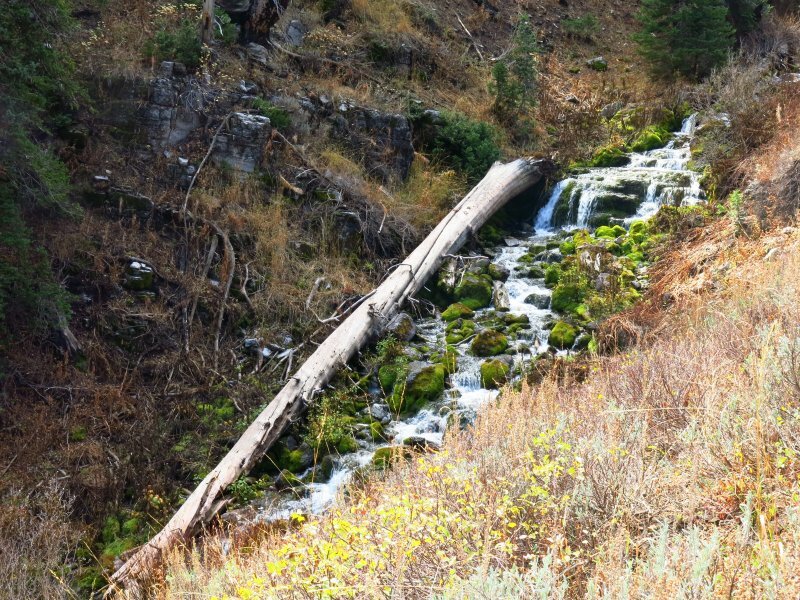 Dave and Nicolai crossed White Pine Creek creek to scout the old Double Top Trail. About 3/4 mile later they rejoined the group on the main trail after passing the old Shorty's Cut-Off trail, something we may explore on a future trip. The remaining hike back to the trailhead was fairly uneventful. 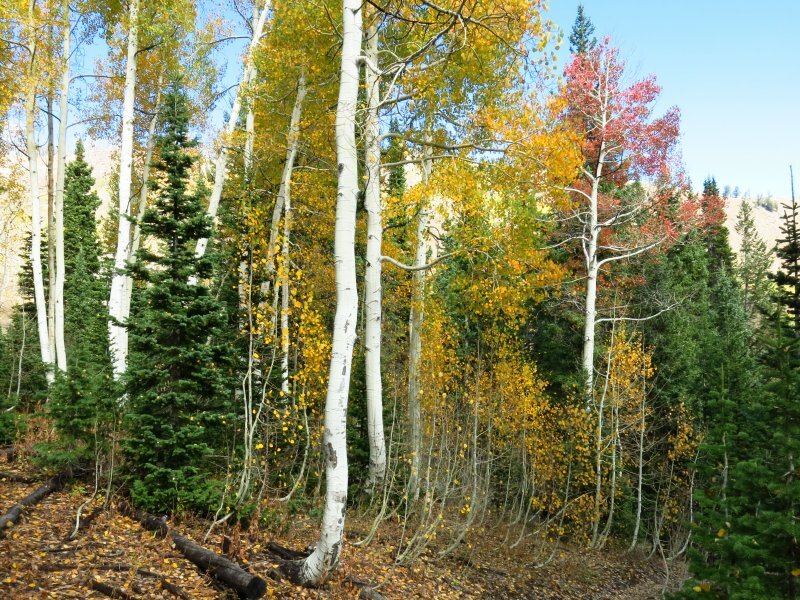 There were a few patches of color but most of the aspen trees had already dropped their leaves (the fall colors were better last year). 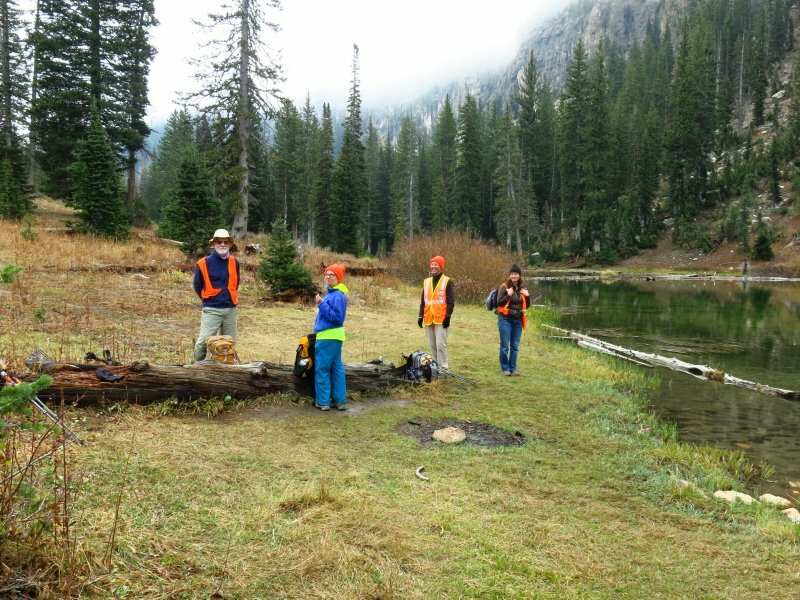 Except for our orange attire, the elk hunt had little impact on our hike, although we did hear a few distant gunshots. 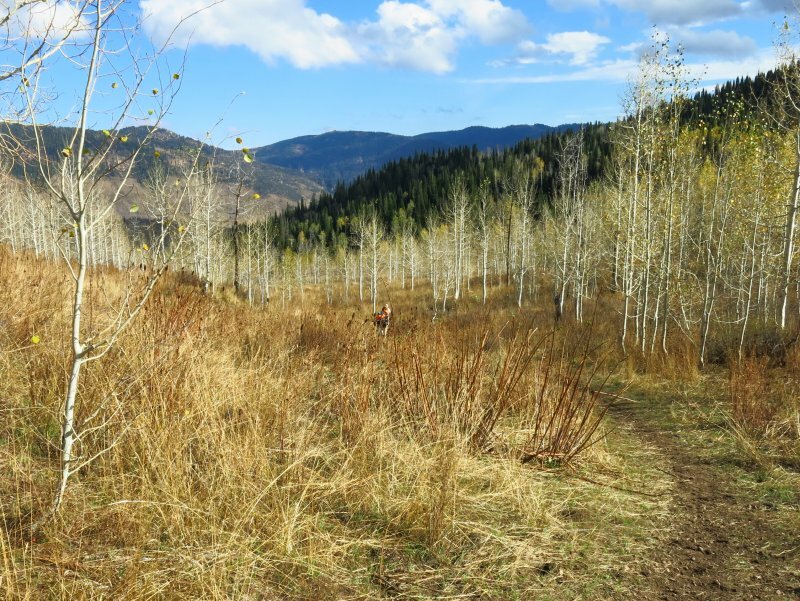 Trail Notes: The trail was in the best condition we have seen for several years. 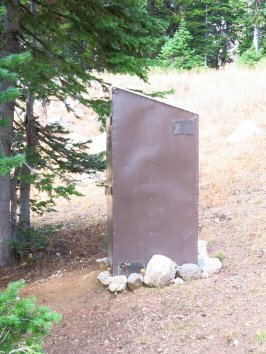 Damaged and missing trail signs have been replaced, switchback shortcuts have been reclaimed, the White Pine outhouse was back in order and campsites were clean, the trail tread was in good shape, no logs were down over the trail and trailside brush was under control. 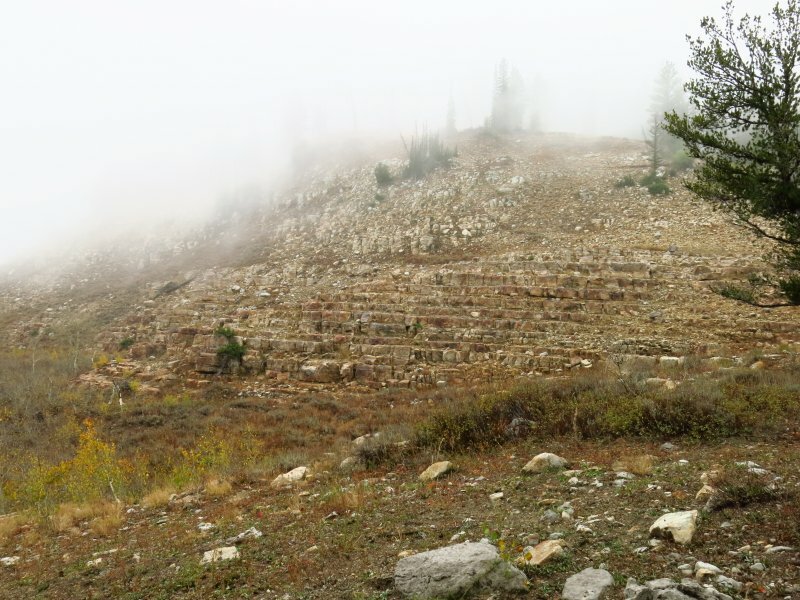 We appreciate the effort by Forest Service employees, trail volunteers and users who helped accomplish this! Most or our hike followed the route of the Bear 100 Endurance Run of the previous weekend so we assume they also had a role. A sign showed the way to the newly restored "restroom"